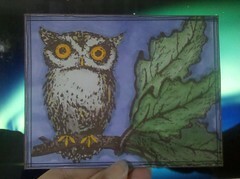 This is the owl I made for an owl postcard swap on swapbot! I used Tattered Angels Graceful Journey clear stamp set and colored w/ copic and spica markers. (The glitter from the spica didn't photograph well). He has huge glittery yellow eyes! I am really pleased with how this one turned out! You have outdone yourself! It looks too pretty to be a PC. I bet the sparkles make it even more stunning in person. The recipient should love it! I found your blog over at Swap Bot and I'm one of your new followers. I love this postcard it is so pretty. That is the cutest owl.